Can you make you own pita at home? Yes you can. I have to credit this basic recipe to a long-ago fellow ferry rider and friend, Hargit. It took me a while to figure out how to cook it properly but I think I’ve finally got it all figured out. Combine all dry ingredients together, then add olive oil and egg and incorporate well. Add the water and knead dough about 5 minutes until a smooth, elastic dough forms. Cut dough into 12 equal portions and roll them out into rounds on a floured board with a rolling pin. Bake each round on a preheated, ungreased pan in the oven until they puff up (around two minutes). 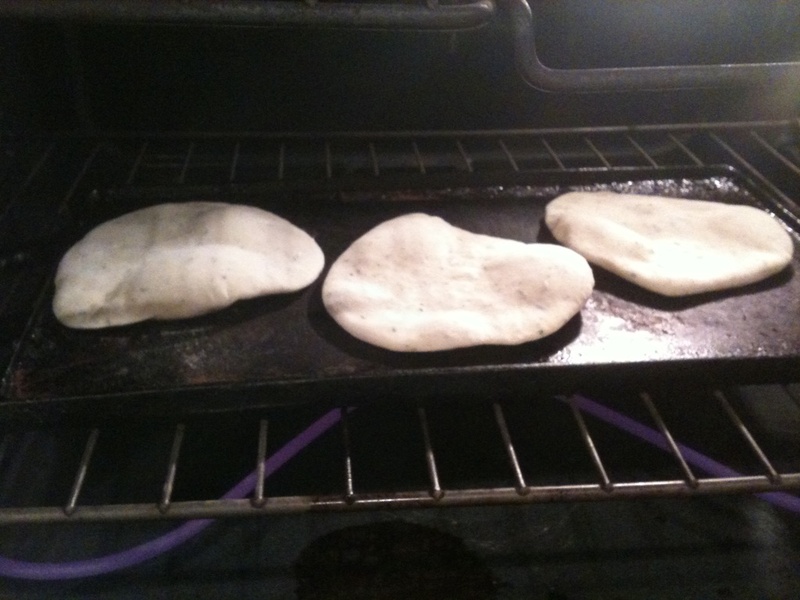 Flip the pita and cook for an additional minute or two until the second side puffs up. Remove from oven and store in a covered container until ready to serve. Store leftover pita in an airtight container or plastic bag. To reheat: Brush both sides of pita with olive oil and cook on a pan preheated to medium heat. If desired, sprinkle with a little herbed garlic salt (I like Johnny’s Garlic Spread). Homemade pita even made a nice addition to breakfast. 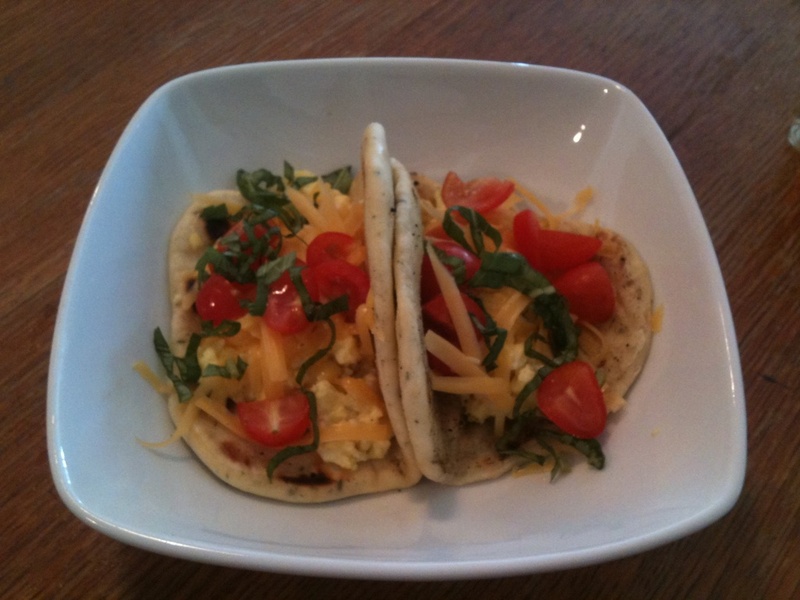 Check it out – pita with a vegetable egg scramble topped with cheddar cheese, a little basil and grape tomatoes. Yum! Tags: easy pita bread recipe, flat bread from scratch, flatbread from scratch, homemade bread recipes, homemade flat bread, homemade pita, how do you cook pita bread from scratch, how to cook pita bread from scratch, pita from scratch. Bookmark the permalink.